This was a highly enjoyable, fast-paced, well-written, well thought out story with excellent characters and an interesting concept. It's structured well. And I love me some character interaction (though this one is missing some of that effortless witty banter I wished it had), and I'm drawn to groups of characters who do well to help each other out (as opposed to those books that have characters who are always moody, and paranoid, and trying to throw each other under buses). 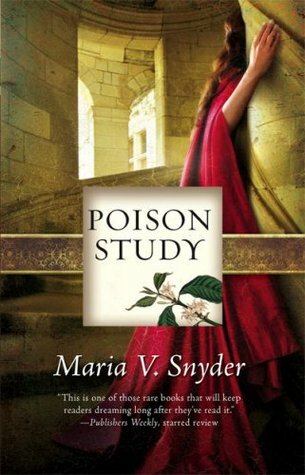 So, yes, I did enjoy reading Poison Study from the beginning until the very end. However, I must say that a lot of things still fell kind of flat -- there was an undertone of intriguing scenarios, but the feeling I got from it was kind of monotonous. Or, well, I personally felt kind of "meh" while reading certain parts of the book. Things just kind of happened... and then we moved on. Also, it didn't help that a lot of the plot twists were fairly predictable -- there were too many hints that forced you to make connections, and when the book itself made a reveal, it wasn't as exciting as it felt like it should have been. Nonetheless, the story thrives on the characters and the world and the concept. To become a food taster for the highest ranking man in the country, with your life forfeit, prepared to die each and every day... It was an interesting idea. Not an original idea, mind you, as food tasters for kings have always been a thing. But still an interesting way to present our young adult high fantasy from the point of view of the food taster. Yelena is a great character: kickass, intelligent, resourceful, level-headed, talented... She's probably going to become superhuman in the next few books if she keeps getting stronger like a shounen manga character. Valek is already able and strong, so the pair of them together will create awesomely superhuman perfect babies... or they'll just be super elite as a couple working together to save the world. I enjoyed the friendship between Yelena and the Power Twins, Janco and Ari. That was a sweet set-up, and I look forward to seeing more of that as well as more friendships developing in the rest of the series. As opposed to stories where everyone is always at each other's throats, trying to stab each other in the back or just being plain mean for the sake of being mean, or betraying friends in order to save their own asses... I think I much prefer seeing characters actually enjoy each others' company and helping each other survive in a bleak world. I liked the developments in the story (even if they were predictable), and I enjoyed some of the brief (very, very brief) "Poison Training" sessions. So, yeah... while the tone of the story felt a bit flat, it was still well-written and I enjoyed reading this book quite a bit. This review was originally posted at Ani's Book Abyss / BookLikes in March 2014.